NOV74-FEB75: Boot Camp, Great Lakes Naval Training Center. No bowel movement for the first ten days. Arrived late to chow hall on Thanksgiving for holiday dinner of cold hot dogs and Jello. Threw up during a training movie featuring extreme close-up shots of what can happen to your weenie when you consort with loose women while on liberty. FEB75-JUN75: School of Music, Basic Course. Named "Student of the Month" despite documented record of instrumental practice averaging 30 seconds per week. JUN75-MAY77: Navy Band San Francisco. "Seaman Mullen's room is the filthiest space I have seen in 27 years in the Navy." As keyboard player for rock band Long Island Sound: break up fights. As staff arranger: come to work on paydays. JUL78-DEC78: School of Music, Intermediate Course. Reamed out by MUCM Jim Thumpston less frequently than other classmates. JAN79-JAN82: School of Music, piano instructor. Dirty Tricks Petty Officer: directed midnight raid on Army barracks that resulted in 300 soldiers waking up on the morning of the annual Army/Navy game with high hopes and no toilet paper. Change-for-a-dollar Petty Officer of the Command: maintained adequate stock of coins so officers could purchase peanut butter cups from vending machines. Petty Officer in Charge of Shaking Commanding Officer's Hand With Joy Buzzer While Receiving "Staff Member of the Year" award: self-explanatory. Developed miniature golf course in band office area. Operated tournaments culminating in sudden-death playoffs on the 18th hole, a par-4, teeing off from passageway outside gear locker, followed by blind dog-leg through MUCM Davenport's office, a risky rebound off the the wall into bandmaster's office and delicate chip-shot into the styrofoam coffee cup under Mr. Chesson's desk. JUL85-JAN86: School of Music, Advanced Course. Inability to control baton in subdivided 6/8 pattern due to weakness caused by loss of blood after being repeatedly stabbed in back by conducting instructor. FEB86-AUG87: 7TH Fleet Band, Yokosuka, Japan. Conduct band at concerts and ceremonies before high-ranking dignitaries. 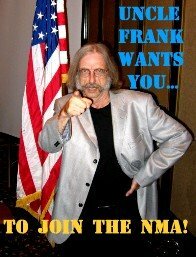 Frank; you could have mentioned the "Gay Ninetys Pizza Parlor" as a sub-heading under NAVBND SF!! !